This has been such a fun month in our little man’s life! In the past month, he has become interested in toys, rolled over, started to figure out how to grab toys, started being okay being put down a little more, began chattering away all the time, and started to laugh a lot. He really has become so much more aware of the world, and everything going on around him! 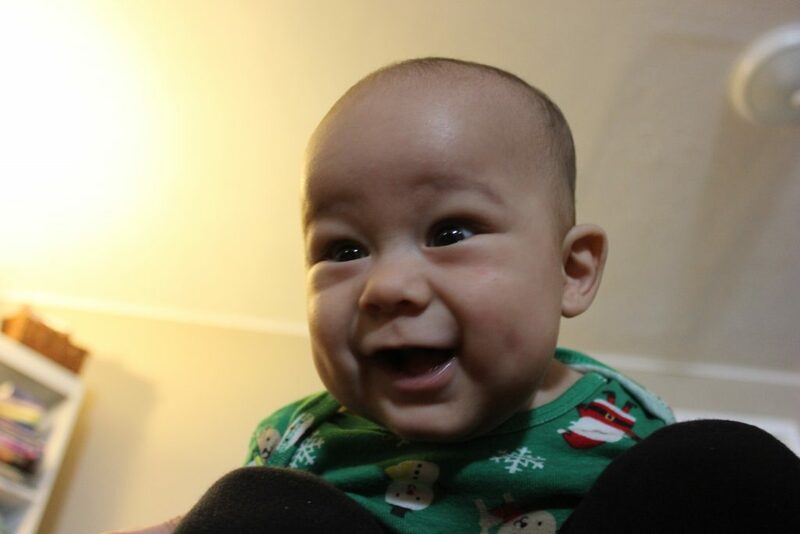 He is the sweetest, most giggly baby boy, and I am completely in love with little him. 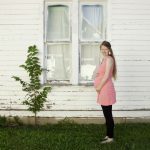 When I was pregnant, I secretly worried about having a boy. I definitely could picture myself with a baby girl, but I wasn’t sure how to be a boy mom. I didn’t realize what an incredibly sweet thing it is to have a baby boy, and now I am so grateful that I am his mama! Since I am a stay-at-home-mom I spend all my time with Gideon, and we have been having a lot of fun! We talk all day long, play, practice rolling over, read books, listen to podcasts, watch tv, clean the house, go on walks, and nap. He seems to be an extrovert, at this point in his life, so sometimes when we both are weary of being cooped up, we venture out. I am really looking forward to spring when he will be a bit older, and we can go on longer walks in the warmer weather! I hate that he is getting bigger, but at the same time there are so many things I am excited about for his future–taking him to playgrounds, the zoo, talking with him, reading books together, and so much more! He makes so many little boy sounds–grunts, growls, and groans. He vocalizes everything, which is so funny! Gideon sleeping on his Opa on Thanksgiving day. 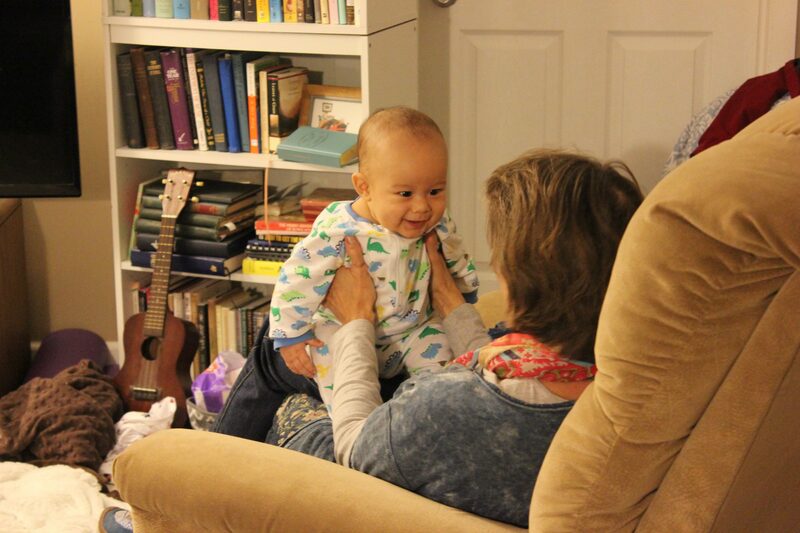 I loved when he was an itty, bitty newborn–but I am loving learning who he is as he gets older, too. 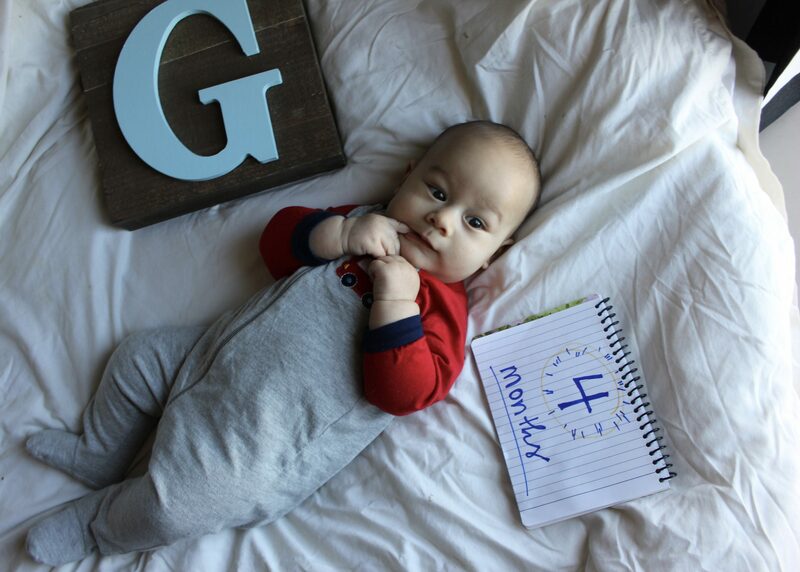 What to expect this month: By the fourth month, babies often roll over (he did! ), start bringing objects to their mouths (he has started to! And he has just begun to figure out how to reach out and grab things, instead of just trying to get things with his closed fist), will be teething (yep! Lots of drool over here), and will be sleeping longer stretches at night (ummm…nope….sniff…I hope this happens soon #ripsleep). What to expect next month: baby boy should start being able to distinguish colors better at five months (can see pastels as well as bright contrast), likely holding things with all his fingers, baby will start trying to crawl. 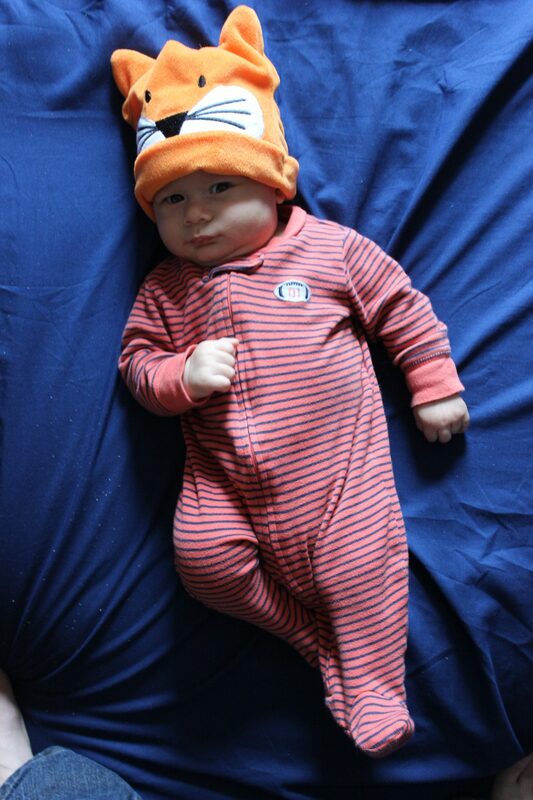 Clothing size: He’s wearing 6 month clothing! 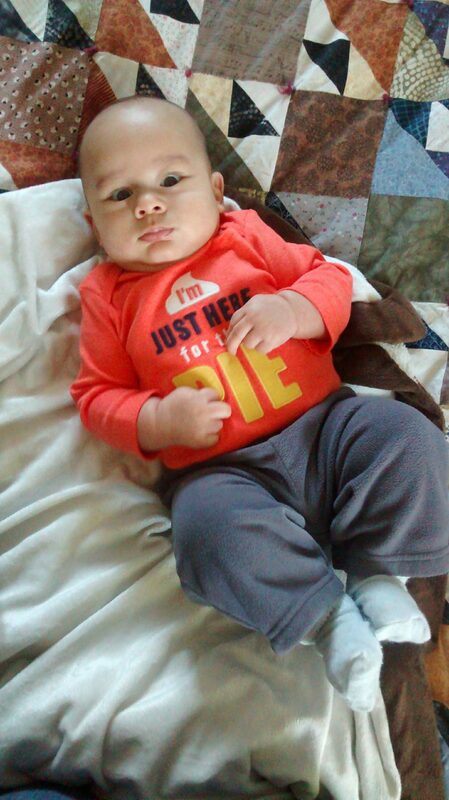 Favorite clothes: I have some baby sweat pants that are by far my favorite thing to keep him in right now! I love, also the little stretchy pants that have footies attached to them, so I don’t have to worry about socks. I am keeping him in a lot of Christmas outfits, which is so fun! Diaper size: He was in size 1s a month ago, and now he is in size 3s!! This boy is growing like a weed! If you look closely, you can find Gideon and I in the stands! 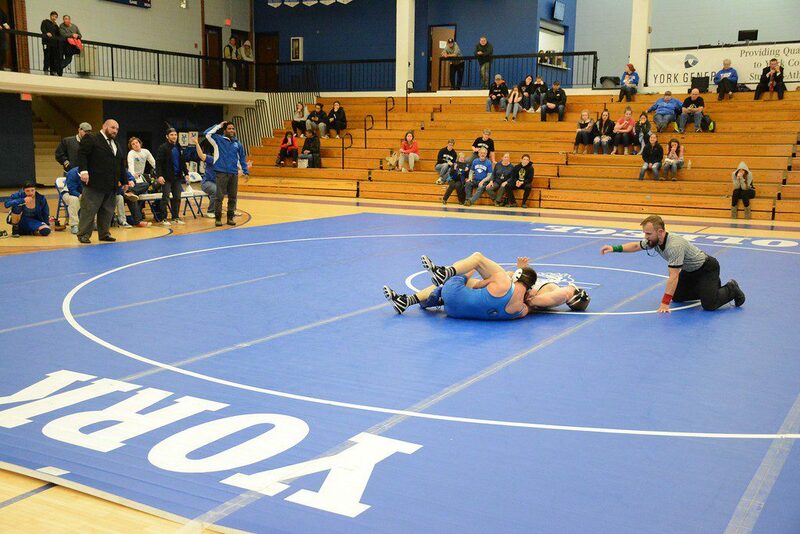 Firsts: Gideon went to his first wrestling match! There was going to be a dual (between our alma mater, and another college) this past week, and Gideon and I tagged along with Hubs to go watch it. Only three wrestlers competed, so it was barely even half an hour long, but it was just a perfect length for us! Hubs was down with the wrestlers, coaching them, and G and I were up in the stands. Gideon watched the whole thing with great interest, and chewed on his hand the entire time. When the President of the college came over to say hi, he leaned down to say hello to Gideon. Gideon looked at him for a moment, and then gave him the biggest smile! It was so sweet. Gideon rolled over for the first time!! He rolled over so much that day. It was so funny–hubby would put him on all fours and he would roll over, and then he would put him back up on all fours and he would roll over again, even before hubby let him go. When he rolled over, he would just lie there with his arms and legs sticking straight up in the air, and look very nonplussed. He reminded me of one of those fainting goats. Ha ha! But then, after he spent the whole day rolling over, he didn’t roll over again for almost a week. I’d put him on his tummy, and he would reach out with his left hand and grab the carpet, and try to drag himself forward. 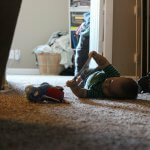 It was as if he had checked rolling over off his list, and now he was intent on learning to crawl. Slow down, baby boy! Gideon had his very first Thanksgiving!! He slept almost the whole way there (a 2 hr and 15 minute drive), was such a sport the whole day, and slept half the way back. I was so worried about how he would travel, and timing it right so he’d sleep in the car, but he really did well! We usually have no less than a dozen or more pies at our family Thanksgiving. So I had to get Gideon this onesie! Gideon has really started becoming a mama’s boy, especially in the evenings. One day, I was having the sweetest conversation with him: he was just softly talking and smiling at me. Then, I had to get up and get something, and Saia knelt down, and in his sweetest voice said “Hey buddy”. And Gideon screeched at Saia, and violently turned away. We both just laughed so hard at him, because he was clearly saying “I want Mama!”. 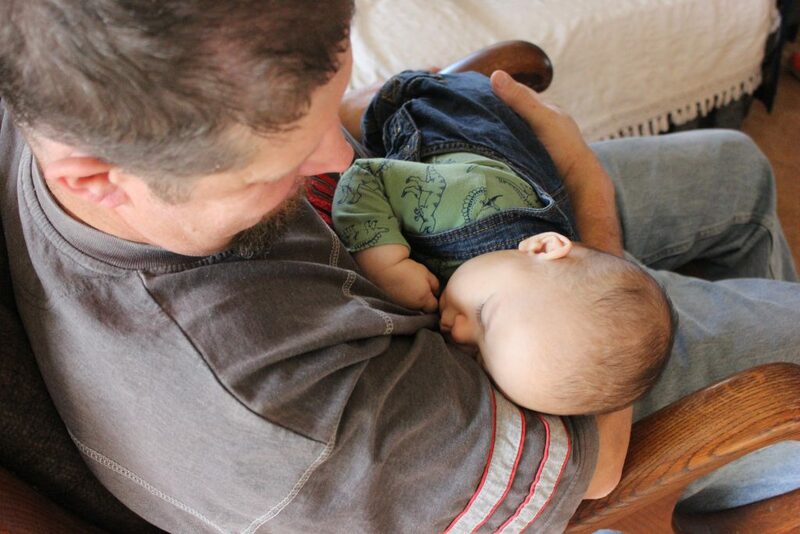 He is still pretty good when other people hold him, and is usually okay with his Papa–there are just times when only Mama will do. Worries: I still have anxiety about Gideon getting passed around at gatherings where I don’t know the people super well. I love it when family and close friends hold him! It is just when we are at church, on campus or other places when a whole crowd of people want to hold him, that my heart races a bit. I have started making a plan before I go places, if I don’t want people to hold him then I’ll put him in his carrier, or have something prepared “he’s fussy right now…etc…”. I didn’t realize how I would feel about this before becoming a mom, but I definitely feel like a Mama Bear when there are a lot of people around. Sleeping: This past month, thanks to some tips from my Mom, Gideon started napping on his own! Huzzah! I, also, realized that I could start working on getting him on a schedule, which has made this type-A girl very, very happy. His schedule is still pretty loose, and changes day to day–but he is sticking to a routine a bit more these days which is awesome. He goes to sleep around 7:30-8ish, wakes up a few times throughout the night to nurse, is up for the day between 7-8 a.m., takes a morning nap usually about 30-45 mins in length, and an afternoon nap of about 30-90 mins long, and a cat nap around 6ish. Some days he wants to sleep a lot, and I have to wake him up so he doesn’t stay up all night long. Other days, he has a hard time taking a long nap, and wakes up every thirty minutes to nurse, so it is still a work in progress. But I love that it is more predictable than it used to be! Most days, I feel fairly well rested. Still holding out for the first time he sleeps through the night! That will be a glorious day, to be sure. Feeding: Gideon remains a very enthusiastic eater. He has become a lot more efficient, these days, and takes only a few minutes of nursing for him to be done. I sorta miss the days when it would take him forty-five minutes to eat! Ha ha! I could get so blog work much done while he ate! I am so grateful that besides those first few incredibly painful weeks, nursing has been pretty straightforward for us. 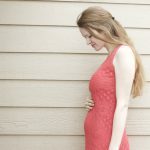 After going through a really tough pregnancy, I am so grateful for the things that have gone well! Purchases I’ve made: This past month, I realized we really needed a few things for Gideon to prepare him for winter! I bought him this hat and glove set, which fits him perfectly, a cover for my carrier which I absolutely love (it makes getting out and going on walks possible again, yay! And it doubles as a cover for his car seat), and this fleece suit! The fleece suit was on sale for $4 when I bought it, and now it is back up to $20. I really wish I would have bought the next size up too, because I am afraid G will outgrow this one before winter is over. Although not entirely baby-related, we did buy a Berkey water purifier this month! The water in our town has been getting increasingly worse, and while we usually tried to buy purified water, it was just harder to get to the store regularly to refill our jus with a baby, and so we just decided to take the plunge. We love, love, love our new water filter! It has made life so much easier, and the water is incredibly different than our tap water! Purchases I am thinking about making: I am going to buy some sort of baby ear protection. Hubs and I love going to sporting events at our alma mater, but I worry about Gideon’s little ears when they are blasting away the music in the gym, so I think we are going to buy something like these. I’ve also been thinking about buying a better quality vacuum. The vacuum we have is a cheap one from Wal-Mart, and it really doesn’t do very well on our carpet. Now that G is spending more time on the floor, I have noticed all the bits the vacuum leaves behind! I think we’ll need to get a better one before he really starts to put everything in his mouth. This is the face he makes when I put him up on my knees and rock him to and fro. He just laughs and laughs! What he likes: He loves when I lie on my back, and put him on my bent legs and let rock him back and forth. He loves looking at himself in the mirror. He loves looking at himself on the camera or computer screen. He really likes when his Papa lifts him up and “flies” him around the apartment. He loves “this little piggy” and will laugh and laugh. He has never met a stranger–and when he is in a good mood, will smile at anybody who will talk to him: college kids at the gym, the President of our alma mater, elderly gents at Goodwill, anyone! He is the most giggly baby, and he just waits in anticipation for someone to do something funny to make him laugh! What he doesn’t like: He still doesn’t love tummy time, although he tolerates it a little bit more these days. He is okay being set down for a little bit, but once he is bored then he is done! He doesn’t like his car seat very much. Don’t want to forget: The day he rolled over, and how Hubs kept setting him back up on all fours and he would just roll over even before Hubs let him go. It was so funny! How I set him down on the bed, and went to get something, and when I came back he let out a huge exuberant shout–he was so excited to see me! How much he laughs at my Mom and my sister. Things I’m looking forward to: I am looking forward to when he gets to six months because then he can start solid foods, ride facing out in the lillebaby carrier (which I think he will LOVE), and ride in the Thule jogging stroller my family bought for us! 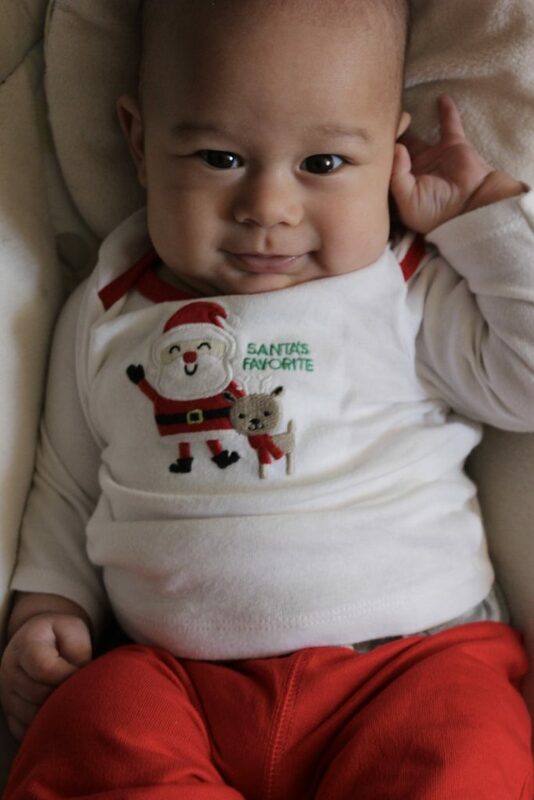 Looking forward to his first Christmas, reading about Jesus’s birth together on Christmas Eve, putting up our Christmas tree, and dressing him up in his little Santa outfit. How’s Mama? Still haven’t quite hit my stride, but I’m closer to it than I was last month! Ha ha! I am hoping that by six months, I will have figured out a routine. I have honestly never been busier in my life. As soon as I get a spare moment, my mind races with whether I should do blog work, house work, cook something, eat something, or shower. Some days I still feel pretty blue, but that is just a clue that I need to bundle Gideon up and go somewhere for a bit. This month, for the first time, I’ve been longing to get back into shape. 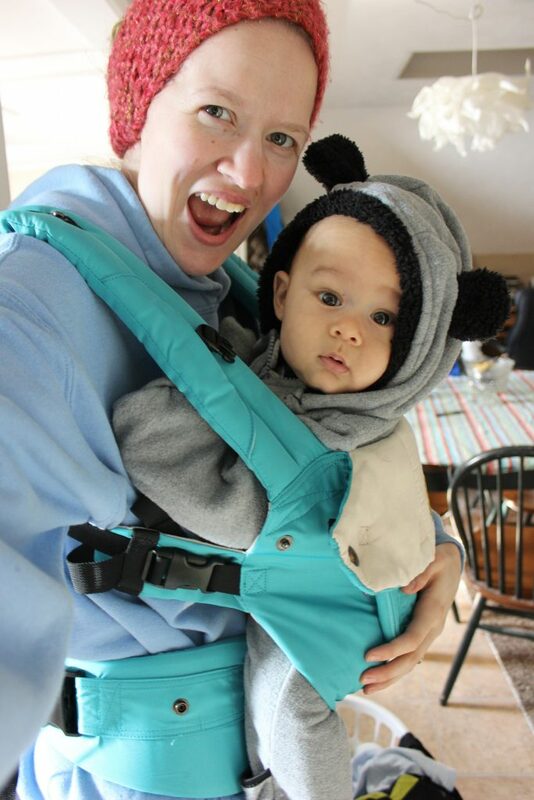 The first few months were really just focused on survival, but now that Gideon is napping on his own, and the weather has gotten too cold to go on walks every day, I’d really like to start an exercise routine. I’d like to be back into my old jeans eventually! I’ve been researching some workouts that are specific for postpartum, because I feel really strongly that I need to rebuild my core before attempting anything else. I’ve been looking into both MuTu and Fit2b and will probably decide on one this week. Hopefully by spring I’ll have a stronger core, and can put Gideon in the jogging stroller and start running again! What’s going on in the Lotulelei household? I’ve been dejunking the apartment, and moving around furniture (remember when I couldn’t do that while pregnant? I am LOVING being able to move furniture! ), Christmas shopping, and making plans/goals for 2018! Hubby has been studying his Music Theory book every evening, and working six days a week. What’s going on in your household this week? What should I write about this year? Gideon is getting so big! I’m glad that you and he are doing well. I hope that he starts sleeping through the night for you soon! I’m glad to hear that you guys have gotten into a daily rhythm-getting into a loose schedule/rhythm can be such a game changer!